United Nations delegates have been negotiating about climate change for more than 20 years, and this December, they’ll meet again in Paris for yet another round of talks. There’s reason to be hopeful, but we already know that even if the delegates finally reach an agreement, it won’t be strong enough to prevent the worst impacts of climate change. No matter what happens in Paris, we know what we need: real climate solutions that create secure union jobs and strengthen community power and resiliency. And to get there, we need to build an unstoppable grassroots movement that can unite organized labor, immigrant rights, racial justice and climate justice groups. 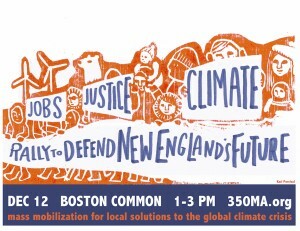 It’s up to us to lead the way — and we’re starting right here in New England with a massive rally on December 12, the day after the Paris talks end! We’ll lift up the voices of New England’s organized labor, immigrant rights, racial justice, and climate justice groups as we call for jobs, justice and climate action together. Join us as we build connections between movements and stand together as one! A student at Unity College in Maine who is participating in part of a school event and to complete Unity College’s mission as America’s Environmental College who was the first to divest from fossil fuel. In Riemann, Hilbert or in Banach space Let superscripts and subscripts go their ways. Our symptotes no longer out of phase, We shall encounter, counting, face to face.